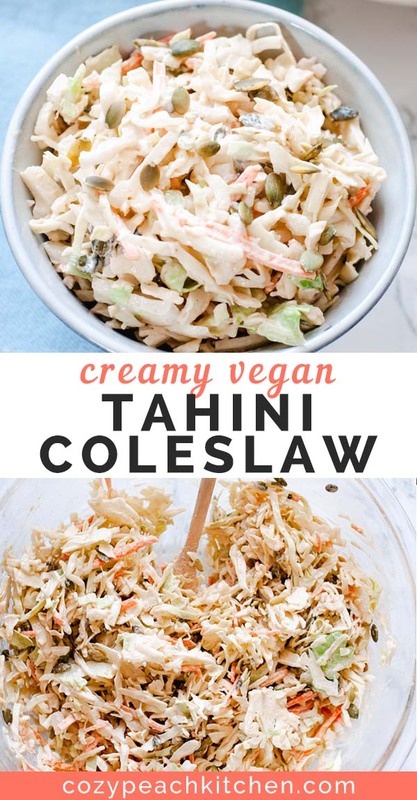 Creamy tahini coleslaw is a fun vegan alternative to classic mayo-based coleslaw. It’s a little spicy, tangy and perfect for summer barbecues! Coleslaw (aka slaw) is probably one of the most spring/summer recipes ever. I mean, have you been to a potluck or barbecue where there wasn’t coleslaw (though maybe you’ll only answer yes if you live in the south)? 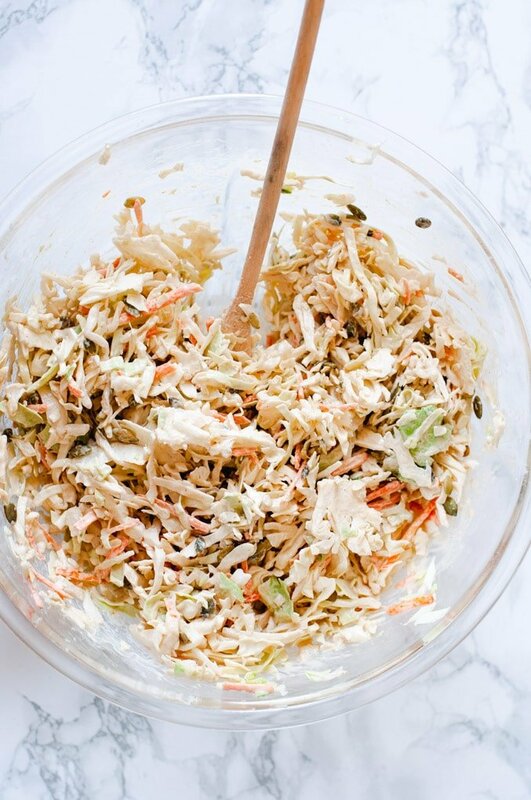 Coleslaw haters beware, this tahini coleslaw recipe is mayo-free and packed with nutrition! Crunchy cabbage is tossed in a tangy, creamy tahini sauce, then topped with pumpkin seeds for this twist on the classic recipe. 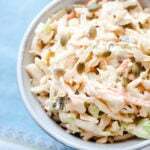 Coleslaw: this often loved, often hated side is one of those great dividers. You either like it or you don’t. I’m definitely on the “like” side of the debate, but sometimes I’m looking for something a little less coleslaw-y. That’s where this spicy tahini coleslaw comes in. It’s creamy but mayo-free, super easy to make and tangy as can be! Tahini is made from toasted ground hulled sesame. You know, that seed you usually see on a burger bun; but this time the seeds have been toasted and ground up to form a nutty, flavorful and creamy spread. Tahini is a flavorful and healthy swap for mayo in creamy recipes. Sesame seeds are high in healthy mono and polyunsaturated fats, zinc and copper. 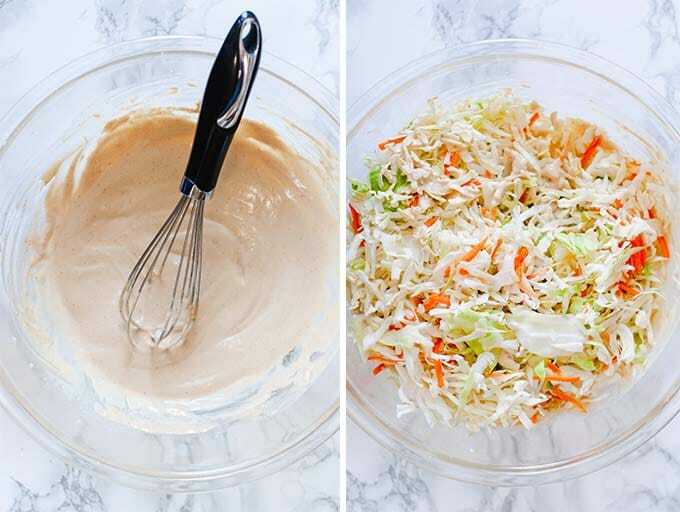 Using tahini in place of mayonnaise is a healthy and fun way to amp up your classic coleslaw recipe! 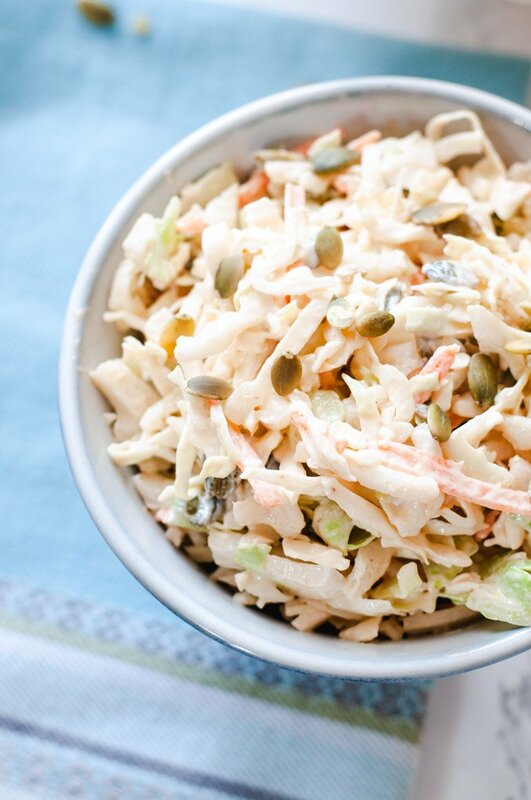 Lucky for us, coleslaw is very simple to make. I use prepackaged coleslaw mix, but you can chop up a head of cabbage yourself if you prefer. 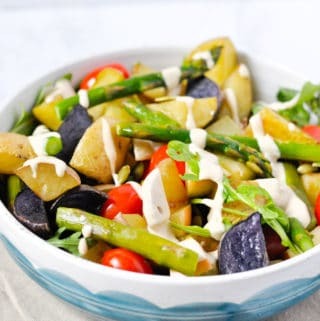 Start by mixing the tahini dressing ingredients together in a large bowl until creamy. You want it to have a salad dressing consistency, like ranch dressing. 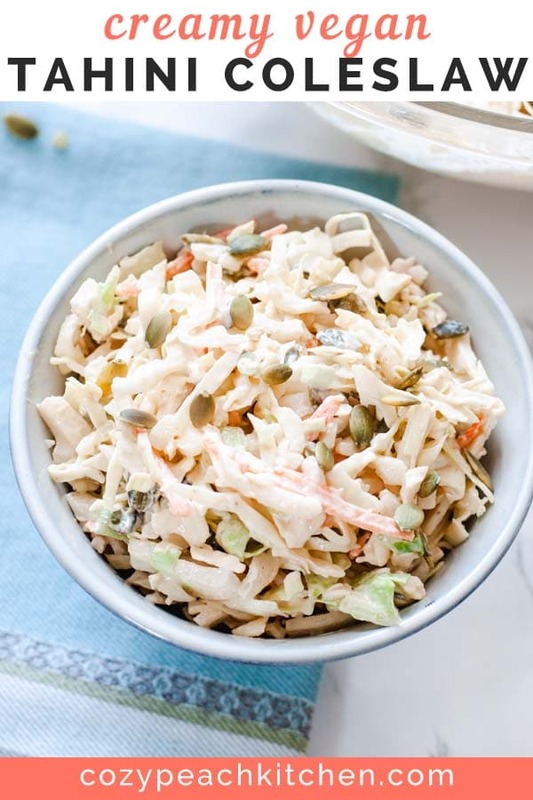 Add the coleslaw to the tahini dressing: mix, stir, and toss with pumpkin seeds. 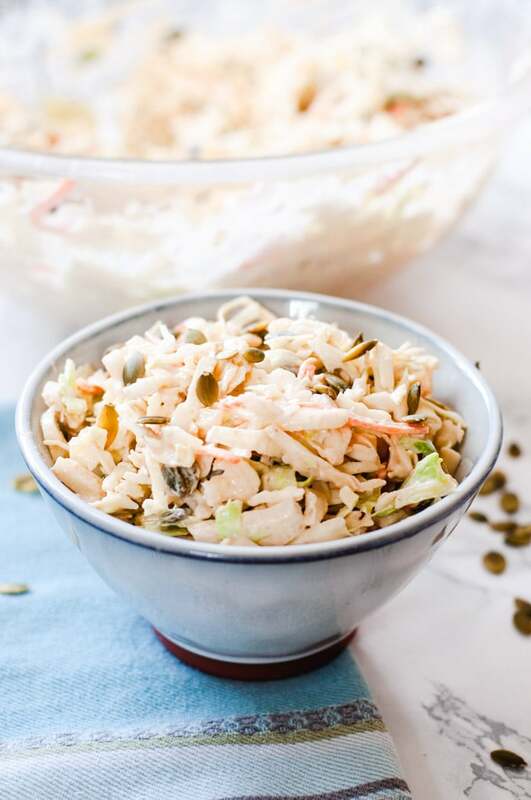 Voila – spicy tahini coleslaw! Enjoy chilled. Did you know that cabbage is packed with nutrients? Cabbage belongs to the cruciferous vegetable category alongside nutrition powerhouses like kale and broccoli. This inexpensive veggie is high in vitamin K, vitamin C and fiber, which are all important to a healthy diet. 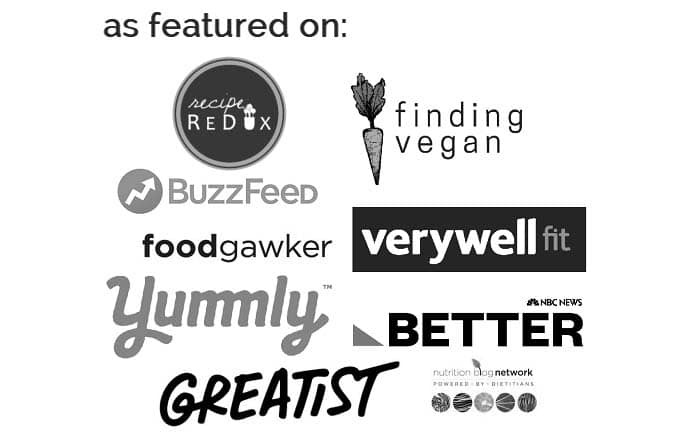 Looking for more recipes that use tahini? 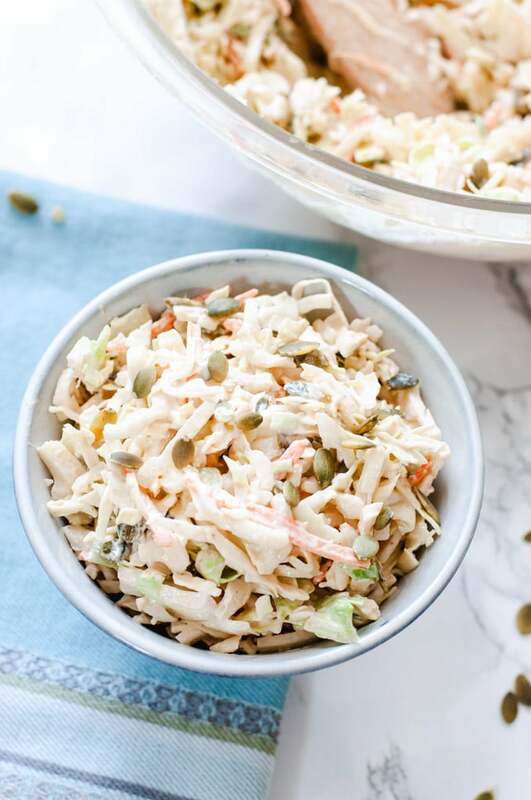 A fun vegan twist on classic coleslaw, this flavorful side dish is made with creamy tahini and tangy apple cider vinegar. In a large mixing bowl, combine the dressing ingredients: tahini, apple cider vinegar, water, brown mustard, hot sauce, sugar, salt. Stir until creamy. Add coleslaw mix to the tahini dressing. Stir with a wooden spoon until the cabbage is evenly coated in dressing. Toss with pumpkin seeds. Enjoy cold.